Old, historic homes can be very appealing with classic features such as stained glass windows and detailed craftsmanship, but may also feature the not so appealing knob and tube wiring. What is knob and tube wiring and why does it matter if your home has it? Let us untangle the facts. Knob and tube wiring was the go-to electrical wiring method from the 1880s to the 1940s. Common in homes built before 1950, knob and tube wiring by itself doesn’t pose a serious threat but can be a safety hazard due to aging and improper modifications. Knob and tube wiring is not illegal but it’s no longer permitted in new construction today. 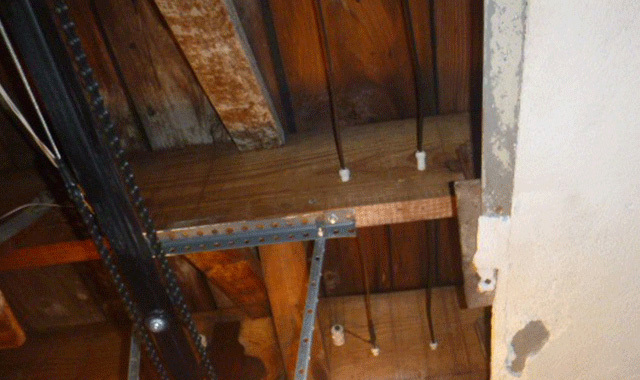 Yes, knob and tube wiring is legal and doesn’t require immediate removal if your home has it. But, such an old method wasn’t designed to handle the electronics usage of today, like microwaves, dishwashers, air conditioners, and computers. Our increased use of electronics can overload knob and tube wiring and overheat the wires, posing serious safety and fire hazards. The insulation for knob and tube wiring is made of rubber, which degrades over time. This increases the risk of a fire starting in the home. We suggest speaking with your home insurance carrier in regards to their policy requisites. How do I know if my home has it? Not sure if your home contains knob and tube wiring? No worries. To identify knob and tube wiring in your home, look in your basement and attic for white, ceramic knobs, typically nailed to exposed joists. The electrical wires snake through the knobs to support the wiring strands and the tubes protect the loose wires. If you don’t find knob and tube wiring in your home, it doesn’t necessarily mean that you don’t have it. It could be hiding in the walls, often referred to as spider webbing. We recommend hiring a professional to open the walls if you suspect your home contains knob and tube wiring. What should I do if my home has knob and tube wiring? If your home contains knob and tube wiring, you’re not required to replace it. But if you want an upgrade (and we recommend it), hire a licensed electrician for the job. The price for replacing knob and tube wiring typically ranges from $5,000 to $9,000 for two-story homes. Even though knob and tube wiring isn’t illegal, it poses the risk of faults and fires in your home. Find your local BPG Inspector for a home inspection that includes interior electrical work.